Bollards help manage traffic flow, enhance security while adding any finishing touches to outside buildings, parks or pathways. 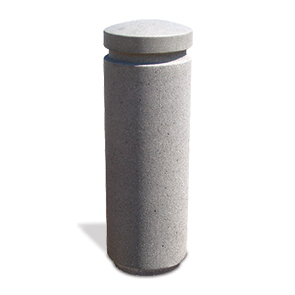 This 3' round concrete bollard has a smooth, rounded semi-dome top that is accented with a robust ring reveal and recessed base, adding modern accents to the traditional design. Constructed with commercial grade precast concrete and reinforced with steel rebar, this bollard will provide many years of strong, unwavering service. Standard and premium finishes are available to maximize the outdoor aesthetic, and meet the ASTM concrete standards.